Viking Age ax charm, commonly called "Ax of Perun". This is a 1:1 scale replica of a Viking Age (a.k.a. Late Iron Age) artifact found in Rinkaby, in Skåne Province, near Sweden's Baltic Sea coast. 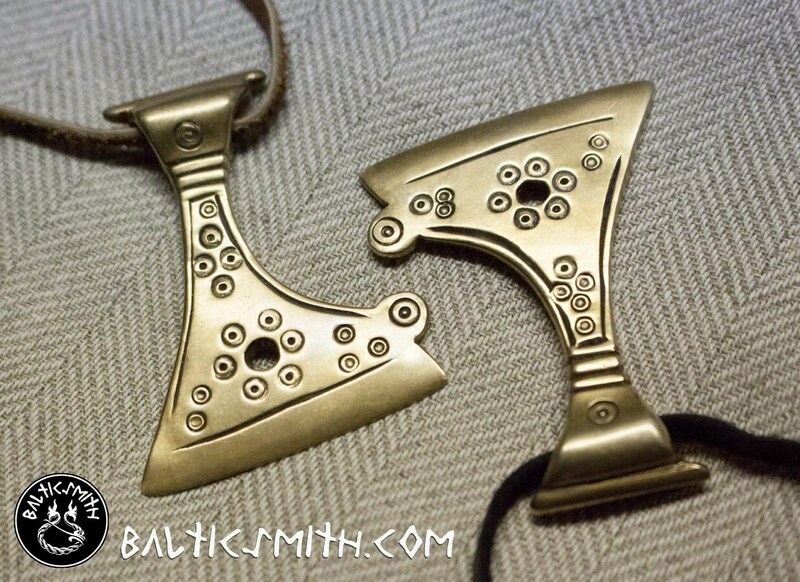 Such charms, also known as votive axes, were more common in Baltic, Slavic and Finnic lands, the Type I ("bearded") votive ax being concentrated mostly along the Daugava River in Latvia. 53 x 40mm (2 1/16 x 1⅝"), 19g. Finished on both sides. Being handmade, these axes may vary slightly in size or weight. See photo for examples of cord, lace, chain and pouch options (24"/60cm unless otherwise noted).